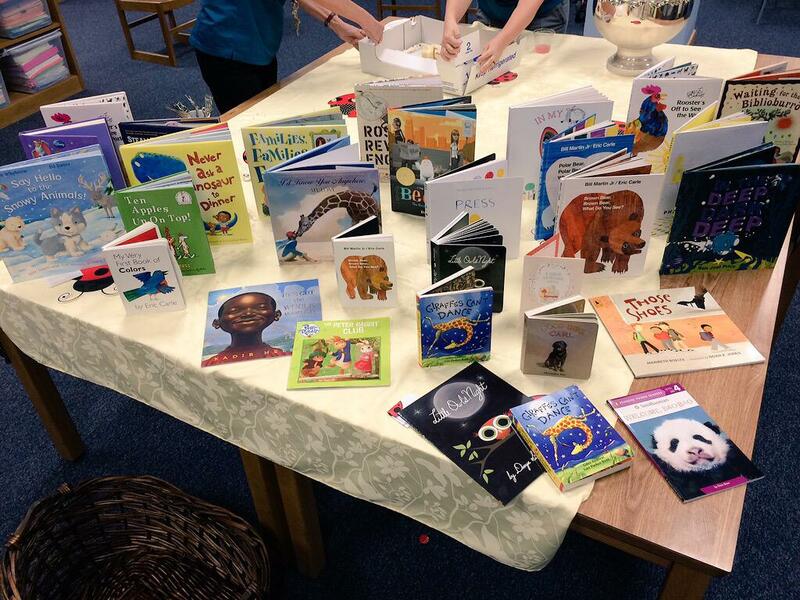 Yesterday my wonderful co-workers threw us an adoption shower, and thanks to them our daughter is an even richer girl if you measure wealth in books. One of the gifts was from Mary Beth. 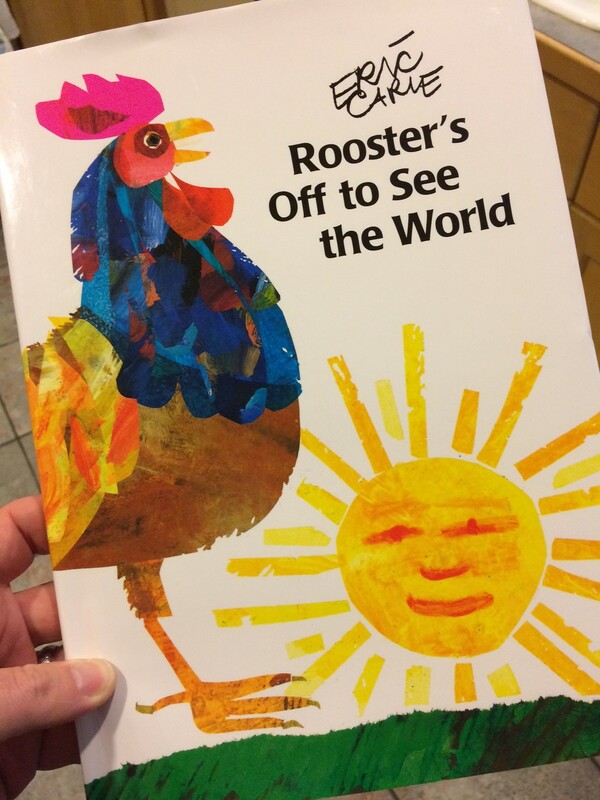 She said it’s a favorite thing to do with a favorite counting book, Rooster’s Off to See the World by Eric Carle. Included with the book was a baggie that contained a small rectangular board and a bunch of small cards with animal pictures. My daughter pulled out the baggie and asked, “What’s this?” I said it was something we could look at while we read the book. 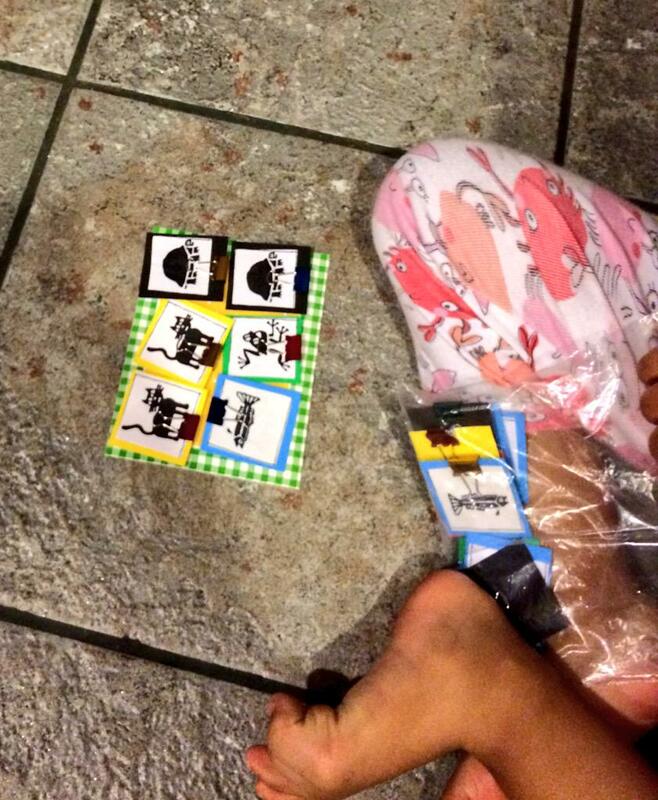 My daughter didn’t want to wait to read the book, so this morning while I made breakfast, she plopped down on the kitchen floor to explore the baggie of cards on her own. Within a few minutes I heard her say, “There’s two cats and two tortoise!” I looked over to see that she had filled her card with animal pictures. And sure enough, the card had two pictures of cats and two pictures of tortoises (or turtles, I’m not sure which yet). I like that all of the counting we do throughout our day has led her to notice and count things on her own without any prompting from me. After she was sure I had seen the pictures, she cleared off the card and said, “I want to do more.” She put all the cards back in the baggie and started filling the rectangular board again. One thing that was really interesting to me was how she naturally made two rows of three pictures on her card. She started digging through the baggie for a few seconds before saying, “I need one more fish.” We haven’t really talked about “one more” very much so it was so interesting to hear her say that. Since she kept laying out the cards in the same arrangement, I’m assuming she could tell there was room for just one more card. I dutifully touched the tortoise, and that was the end of the activity. 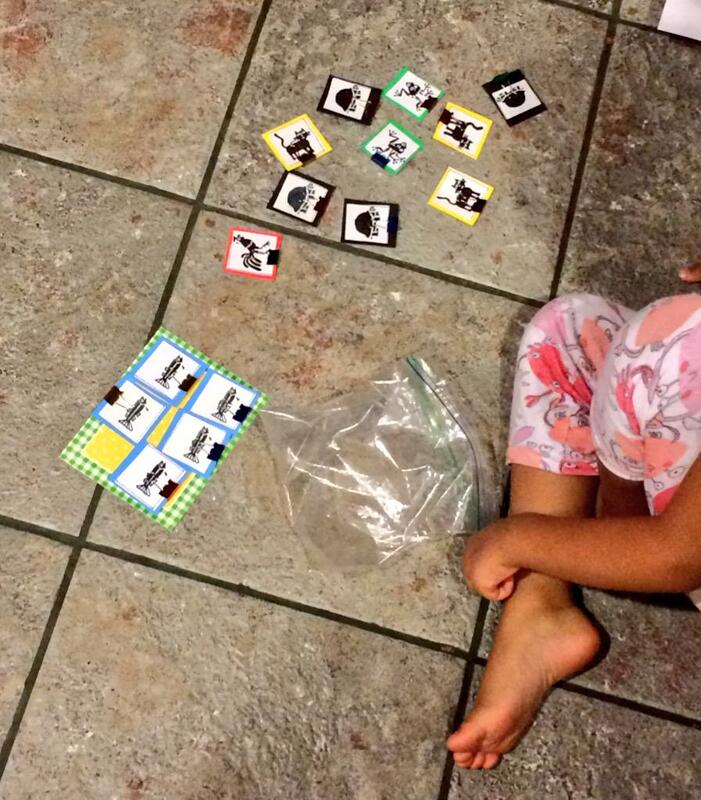 She put all the cards back in the baggie and moved on to looking at another one of the books she received yesterday. How many tortoises are on the board? Are there more cats or fish in the baggie? How many animal cards are not on the board? All of these are great math questions, but they’re MY great questions, not my daughter’s. I want her to develop her own questions and curiosities to explore. In the end, it was much more fascinating and rewarding for me to see the ways she came up with to explore the cards and to share the things she noticed about them. Thank you, Mary Beth, for the wonderful gift! This entry was posted in Uncategorized and tagged #tmwyk, adoption, counting, notice and wonder on October 10, 2015 by bstockus. We’ve had our foster daughter since November 2013. She came to us at 19 months old, and she is currently 2 years 5 months old. 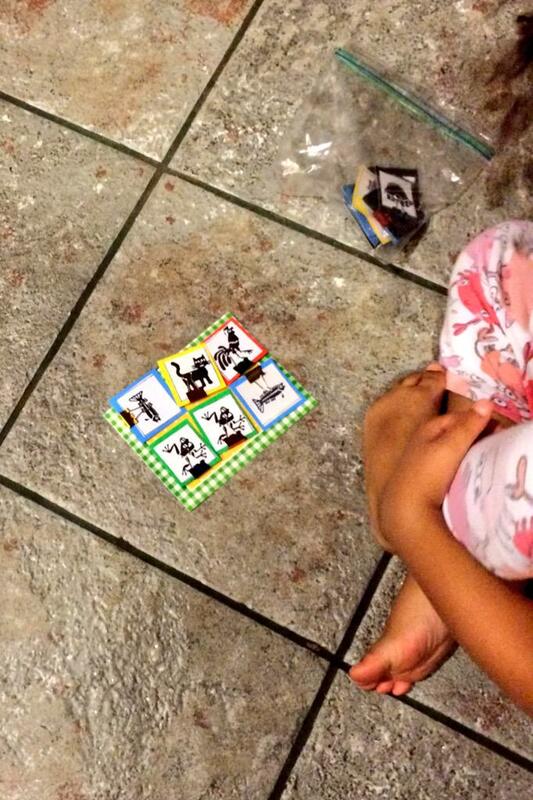 One of the things that I’ve enjoyed watching is how she’s become more strategic at putting away her blocks. They come in a box in a 6 by 5 array. 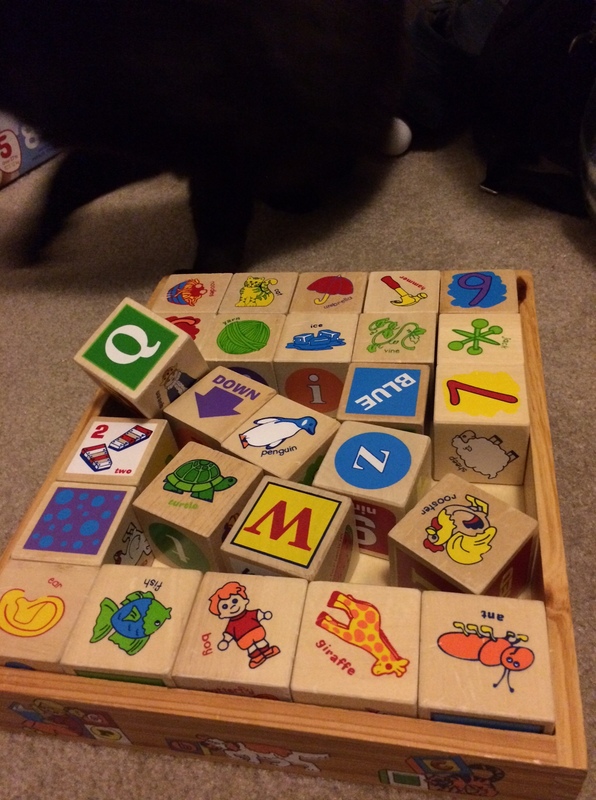 When she first started putting away the blocks after playing with them, she was, shall we say, haphazard about it. She would start by placing the blocks inside the box in any way she pleased. I tried to recreate how she’d start since I don’t have any pictures of early attempts. This is probably even more neat than how she would have done it at ifrst. This strategy worked fairly well until the box started to get a bit cramped. As she pushed blocks into smaller and smaller open spaces, some of the blocks would shift and move into the array configuration afforded by the box. Unfortunately some of the blocks would move in other directions, often ending up turned in ways that made fitting the rest of the blocks much more challenging. This should give an idea of the troubles she would run into. When blocks were turned, they often made pushing new blocks into existing gaps much more challenging. 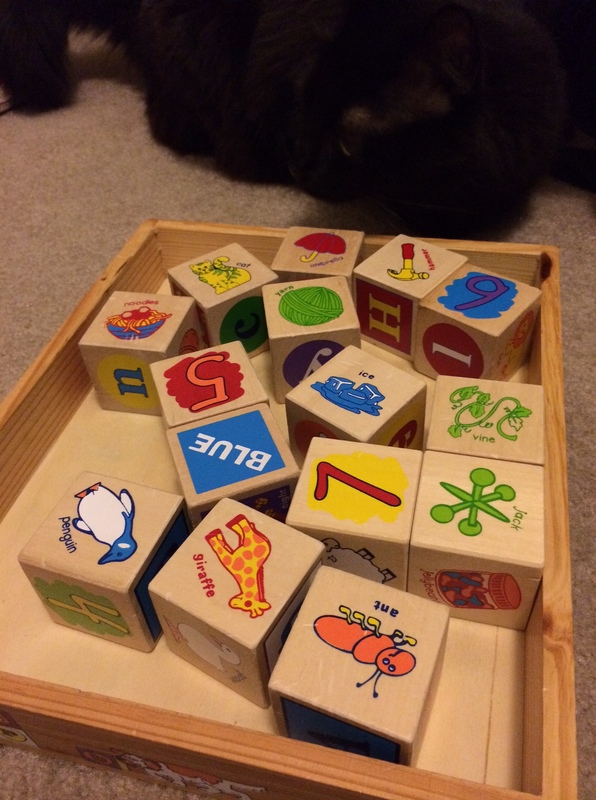 Despite the challenge this presented, I always marveled at her persistence in pushing and moving the blocks until she would get them all to fit nice and neatly in the box. Sadly, I don’t have any videos of her early attempts at putting away the blocks. I did happen to take a video the other day showing how far she’s come from her early “trial and error” days. You’ll see there’s a lot more structure to her placement of the blocks. It seems informed by a mental image she’s developed of what the blocks should look like when she’s done. Unfortunately she is not that verbal, so she can’t really talk to me about what she’s doing. Instead, I chose to sit back and watch. (So technically this is more Watch Your Kid Do Math instead of Talking Math With Your Kids.) Since this is clearly a task that she has always been able to figure out on her own, I’ve felt better keeping my mouth shut anyway. Clearly she’s been doing a lot of meaning making on her own over the past few months. In some ways it’s excruciating to watch someone take over 3 minutes to put 30 blocks away, but as a parent and educator, I can’t help but be fascinated and wonder how she’ll be putting them away a few months from now. 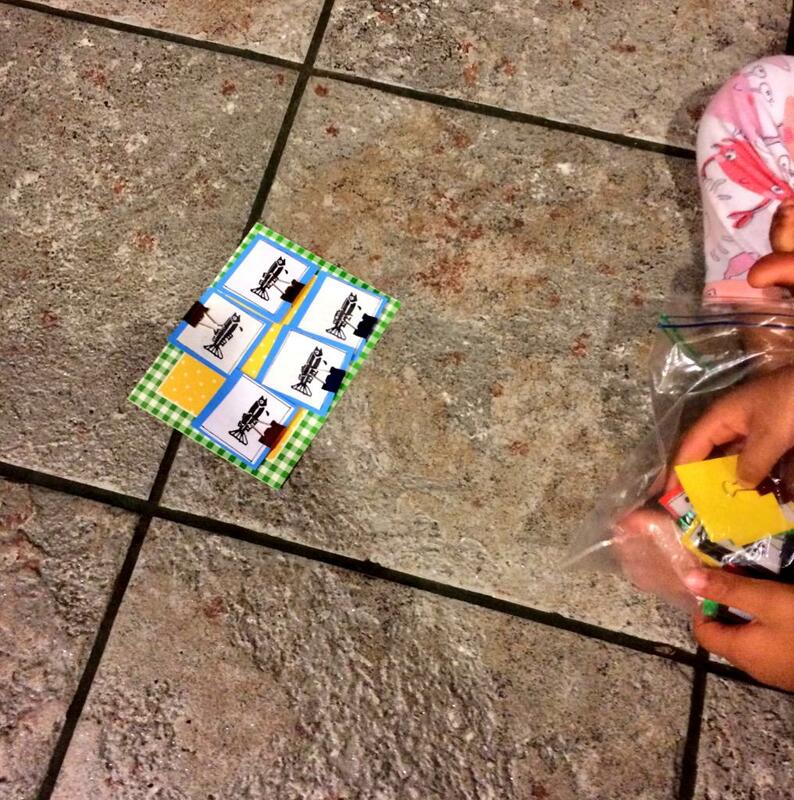 This entry was posted in Uncategorized and tagged #tmwyk, array, blocks, spatial awareness on July 5, 2014 by bstockus.